The lesser celandine is in early spring often the first green plant that occurs in large masses in light forests. The leaves of scurvy herb sometimes make all the rugs, where they grow. After the shiny leaves bright yellow flowers which, while add the leaves carpet a cheerful lights, but also indicate that the lesser celandine leaves are slightly toxic henceforth appear. Before you can see the leaves of the herb against scurvy springtime lethargy in salads eat. The leaves of scurvy herb should only be taken before flowering and not in large quantities. They contain a small amount of toxic pungent compounds that are increasingly present at flowering. 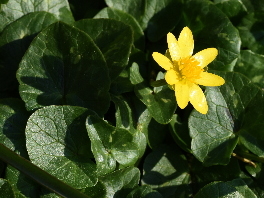 Celandine leaves can be eaten in the wild plants salad in small quantities. Because they contain a lot of vitamin C, they help to vitamin C deficiency and spring fatigue. The flavor of the leaves is spicy, pungent and slightly bitter, which makes them a good seasoning in salad. You can use the chopped leaves on bread or herb quark. Of dried celandine leaves can be cooked a tea taken internally against skin diseases, including Blemishes helps. In addition, you can use this tea for ablutions. It can help against hemorrhoids celandine tea. When dried leaves the poisonous substances are degraded. Since the tubers like genital warts look similar, they have traditionally been used to treat warts. The sharp juice of the tuberous roots can actually etch away quasi warts. The flowers you can harvest and insert it into vinegar. You can use it as a substitute for capers. The leaf buds, which are due to its appearance also called sky barley, manna from heaven, or manna, was formerly dried in bad times along with the root nodules and ground into flour. Formerly known as scurvy (vitamin C deficiency disease) was still widespread, the leaves of the herb were scurvy as a cure for scurvy. The early adoption of scurvy herb against genital warts was based on the doctrine of signatures. The tuber looks warts namely quite similar and the doctrine of signatures examined the uses of medicinal plant based on the similarities of a plant or its parts. The Celandine is native to sparse forests of central and northern Europe. Also on meadows and in bushes occur in places such as in front of large carpets, so often it is there. In early spring, the lesser celandine is often the first plant that sprouts from the ground, well before the trees get leaves. From fleshy tubers that are reminiscent of genital warts grow more stems with heart-shaped leaves at the end. The leaves can also be kidney-shaped, they are sawn or perforated and shiny. Often the leaves are so dense that they cover the floor completely. After a while, yellow flowers develop on separate stalks. The flowers have many petals arranged in a star shape. From the appearance of the flowers increases the poison content of the leaves (Anemonin, protoanemonin) significantly, therefore the leaves should not be used from the heyday. Although many insects visit the flowers, barely formed seeds. Instead arise in the axils of lower leaves small brood buds. These brood buds later new plants grow. In heavy rain this breed buds are often swept together to make it look as if it had been raining wheat, because the brood buds resemble grains. Sometimes they are also called sky barley, because they were in bad times and the food. From the end of May, the above-ground parts of the celandine be drawn back into the earth. Humid and shady places in the garden are suitable to grow there the lesser celandine. Because it most abundantly found in its natural habitat, you can dig up the corms and dig in your garden, if you have the permission of the forest owner and the location not a nature reserve. Over several years, the lesser celandine is spread in the garden when it feels comfortable in the new location. Although the flowers are the most striking at the lesser celandine, they are not used. However, they help in locating the plant because they shine so strong. However, it is unfortunately too late for a crop of lesser celandine leaves. The place you can but remember for the following year. The leaves of the herb are Scharbock namely harvested before flowering. One picks one sheet. They are used as part of a fresh wild herb salad best, but only in rather small quantities, because of the spicy substances contained. Dried you can indeed use the lesser celandine leaves as a tea, but its healing effect is of relatively minor importance. When showing the buds of flowers, you can collect them and place as a substitute for capers in vinegar. The leaves of scurvy herb similar to those of medium strong toxic, but is rare, except in Austria. It is therefore important that you already get to know the location of scurvy herb in the previous year based on the flowers. The flowers of wild ginger are red and bell-shaped. The leaves smell sharp and burning when she grinds.